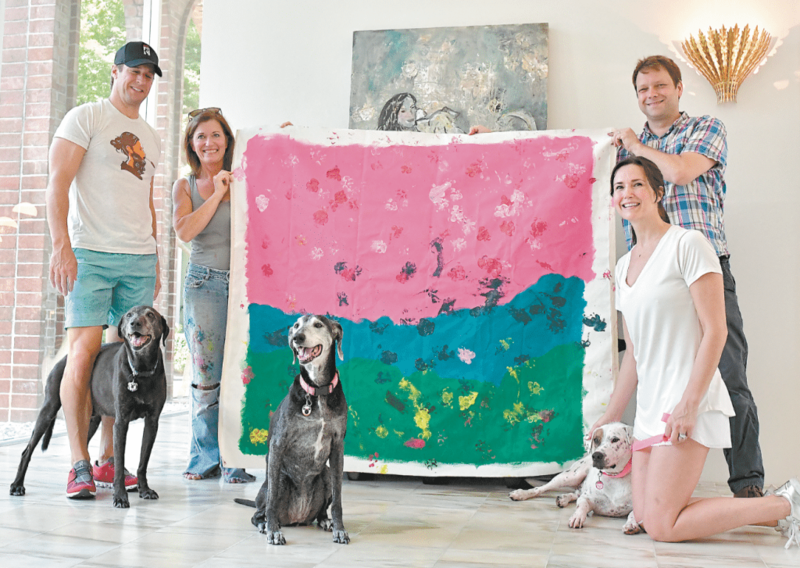 From left, Bart Yancey, Melanie Layne, John Lytle Wilson and Danielle Yancey with artists Willie, Sweet Pea and Trooper “Lucky.” Journal photos by Lee Walls Jr. 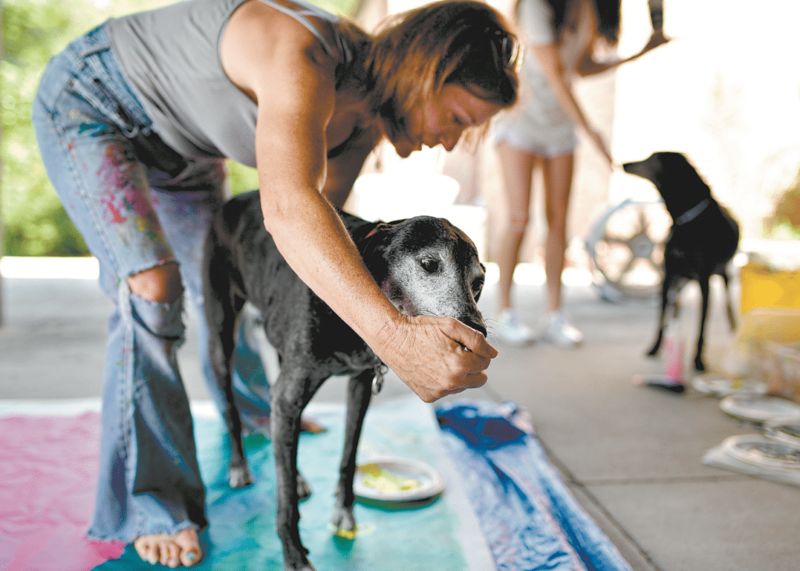 The finished product will be on display alongside five other artist and canine collaborative works at Hand in Paw’s annual Picasso Pets fundraiser Aug. 11. Treats for the artists for a job well done. Yancey, a member of the animal-assisted therapy organization’s board of directors and chairwoman of this year’s Picasso Pets, has participated in the painting process previously with her two Weimaraners, Sweet Pea and Willie, and once with her newest family member, Trooper. “I wanted to get a painting with all three together this year since my oldest (Sweet Pea) is almost 15,” she said. Though her love for each of her fur babies emulates her deep love for animals and animal welfare, her rescue dog Trooper has become her partner in advocating for animal welfare organizations, including Hand in Paw. While in Yancey’s hometown of Dothan for her sister’s wedding a few years ago, a pink dog standing in the middle of a wooded road crossed the path of the couple’s car headlights. The car stopped, Yancey got out and knelt down on the road to hopefully keep the emaciated and mange- riddled dog at ease. With a little patience, he approached and she led him toward the back of her car until she found a moment to quickly scoop him up and place him in her car. He was hers from that night on as she slept beside him in the garage. Trooper has now grown a short white coat with black spots and stands alongside Yancey all around town at the organization’s events sporting a yellow Hand in Paw handkerchief. 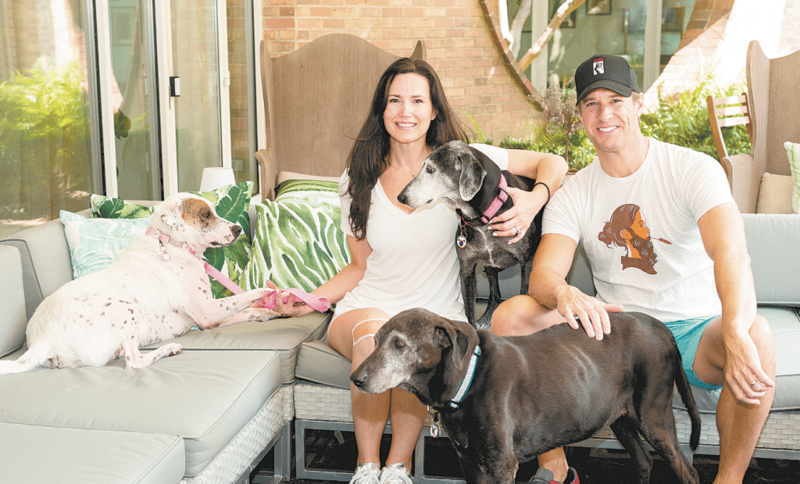 Danielle and Bart Yancey with their dogs Trooper “Lucky,” Willie and Sweet Pea. At the Picasso Pets event, Wilson’s colorful work of art will be on display and works cohesively with this year’s theme, Pop Art. Also debuting will be works by Bob McKenna, with Cameron and Scott Vowell’s pet Elsa; Kristi Oelschlaeger, with Kim and Corbin Day’s pets Callie and Fhearguis; Thomas Andrew, with Kathryn and Cody Ryder’s Murphy; and Linda Ellen Price, with Cathy and Jack Stephenson’s Sadie and Braxton. Guests are invited to wear their most colorful cocktail attire for the event, which includes live and silent auctions, a seated dinner and live music. For more information, visit handinpaw.org.